“Time is a kind of network system where the past, present and future are in constant dialogue and interaction: our past gives foundation from which we build our present and future, our present gives foundation for our future, the present reconstructs the past, and the future reconstructs the present and the past. I am somebody’s past as well as somebody’s future and there is a responsibility in the recognition of that. I think traditional African cultures (or ancient Eastern cultures in general) honored that concept, but it was somewhat lost or repressed in mainstream European-based Western culture to forego accountability and to favor a linear and individualistic thought pattern. 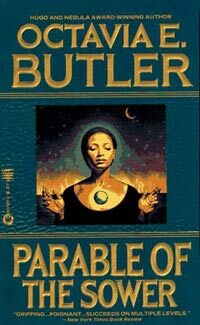 When it comes to afrofuturism, the lens from which I explore cultures of the African Diaspora on this blog, Butler’s words and my blog name is how I view it. Afrofuturism is not some linear progressive path to a far-flung future, but a constant re-examining and reconstructing of the past and present. Afrofuturism centers on applying the elements of speculative fiction, science fiction, fantasy, magic(k), science and technology, myth, mysticism, and spirituality to the exploration of the African Diaspora. Mainstream cultures and societies, and even those within our own cultures, something see black people as not part of these genres, concepts and discussions. Our present erasure from them is essentially an intentional and unintentional erasure from the future. These fictions, myths and fantasies about black people and what they can do and be a part of not only happens still today, but has happened for a long time. But I find comfort in that despite that attempt to do so; if we actually look for the truth, we have always been involved in those areas and had those thoughts, even before the terms black, Afro, and African existed, as Saul Williams said. Just look at the Dogon, the Yoruba, the Egyptians, the Malawi water priestesses, the Botwana python worship, and the countless other futuristic, and speculative thought and spiritual patterns and systems Africa and its diaspora developed. It is funny that people will admit that human life originated in Africa, but will not admit that African people and its diaspora also originated many of the human things we do. And we continue that today as we can see in the works of Sun Ra, Parliament Funkadelic, Labelle, Janelle Monae, Grace Jones, Williams and numerous others. Thus, the purpose of this blog is to expand the representation of the African diaspora in media, education and the world outside of conventional views of us, past, present and future. It is to uncover, re-examine and support those histories and stories that were made invisible while also participating in world-building for our future. Let us imagine and show ourselves and others the different world we have had and can have.